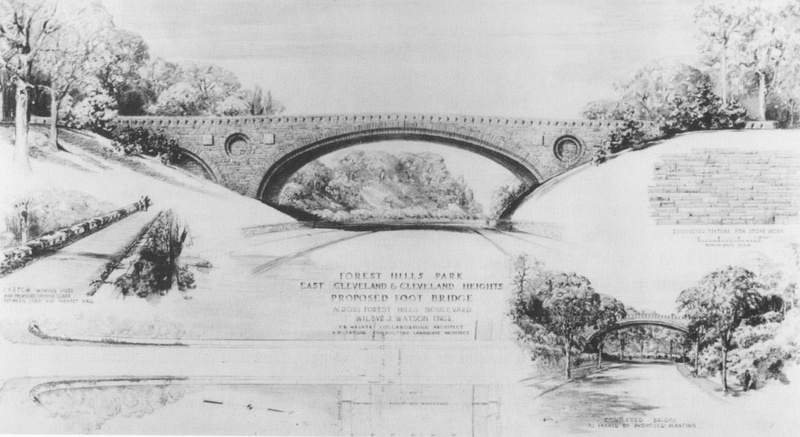 Forest Hill park is a 235-acre oasis located on the edge of the Appalachian Mountain foothills in East Cleveland and Cleveland Heights, OH. Overall, the park is about 40 percent forest and 45 percent meadow. The remainder has been developed for recreational activities. It has an interesting topographical diversity provided by its two largest and deepest ravines-the Dugway Brook watershed and the valley where Forest Hills is located today-and by the 100-foot rise in ground level within the park. The surface soil, called Miami Clay Loam, is silt loam overlaying heavy clay loam, both residue from the last glacier to cover vast portions of North America. Bedford shale and sandstone are under the loam. Some of the sandstone is Euclid Bluestone, which was quarried for walls and bridges built in the park and for other uses elsewhere. Some of the hardwood trees, such as sugar maple and beech, that line the sides of the ravines, are very old. Enormous oaks and chestnuts are located on the drier edges of the ravine tops, plateaus and ridges. Even the dead trees provide living quarters for park inhabitants and make it possible for a variety of birds and animals to use the park. Approximately 450 different plant species have recently been identified in Forest Hill Park, including several endangered species such as hairgrass and withe-rod. The encroachment of native and non-native invasive plants, including Japanese knotweed, tree-of-heaven and buckthorn, are a threat to the endangered plants, as well as to all the plants in the park. The "invaders" also take space that could be available for more desirable plants. 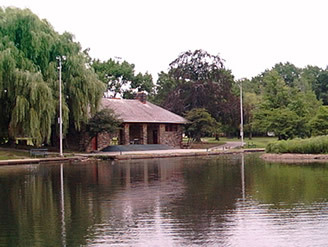 A lagoon and Dugway Brook are the park's main water features. The lagoon is man-made and is home to fish, turtles, ducks and too many geese. A great blue heron spends many hours decorating the island in the lagoon in summer months. The spillway and cascade emptying the lagoon are one of the park's finest features. 1. Boathouse and lagoon. Includes restroom open periodically. Originally intended for storage and rental of boats and comfort facilities. 2. Rustic stone masonry bridge and spillway with cascade that drains into the lagoon. 3. Meadow vista, a smaller version of the Great Meadow. Retains much of its original character, but picnic sites, trails and meadows need restoration and trees need maintenance and replacement. 4. Graceful pedestrian bridge designed by East Cleveland Engineer Wilbur Watson and Frank Walker, architect. 5. Site of Rockefeller home with view to Lake Erie. Built in late 1870's as a sanitarium, converted in 1881 to Rockefeller summer home. 6. Great Meadow and ravines containing old growth forests. View originally extended from the site of house to Lee Boulevard. 7. Site of Rockefeller barns and stables. A portion of brick wall and brick paving remains. 8. Beautiful stone bridge built in late 1800's using stone quarried on the property. Enabled horse drawn carriages to cross a ravine to reach the Rockefeller house and stables. 9. Dugway Valley, site of a restored picnic shelter and restroom needing restoration. Dugway brook flows underground through the Valley. 10. Heights Rockefeller Building containing apartments, offices and retail space. Built c. 1930 to complement and serve Forest Hill sub-division. Andrew Jackson Thomas, architect. 11. Forest Hill Historic District comprised of 81 "Rockefeller homes on the Nation Register of Historic Places", several other unusual homes with steel supports and many other attractive homes with slate, tile, or cedar shake roofs. Whatever Became of Park School? Before the JCC: A Pictorial Tour of "Glen Allen"